When I first heard of the Messy Workshop Blog Hop, hosted and organized by the delight Brenda Sue of B'Sue Boutique, I didn't think it was something for me. Not because my studio is so clean and tidy, but because I'm extremely private about my studio space. Only a handful of people have actually been in my studio and I consider it a creative sanctuary. It's generally off limits to EVERYONE and if company comes over, I will sometimes staple fabric over the doorway (like a tapestry) and put furniture in front to hide the entrance. HOWEVER... it is so messed up and so far removed from what it is "supposed to be" at the moment that I thought it would be okay and might actually prompt me to work on it. When I do work in here, I tend to tidy up an area first. So try not to imagine me straddling sewing machine boxes and picture frames. In this picture, you'll see the unfortunate color that I decided to paint the studio. What I thought would be a vibrant and energizing green turned positively neon under the fluorescent blubs. Believe it or not, it was actually more messy before! We had let the laundry pile up and there were baskets of clean cloths stacked in here as well. I will point your attention to some of the plastic bins, as they are all sorted by color, usage and price. I have everything labeled and marked. In this space that is currently a pile, there used to be a small sofa and a low, wide coffee table. With the lamps, it felt quite cozy. Then I had a large plastic table, where everything was laid out like a rainbow of beads. I also had a rather pretty faux-Persian rug. 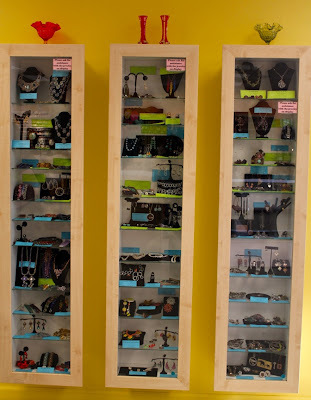 This is an example of some of the newer black acrylic trays for organizing. I usually use cookie sheets lined with felt. When I moved my studio to the store and back, things sort of got thrown together. 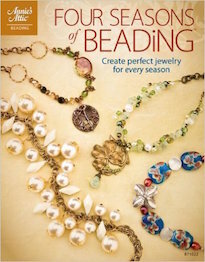 There's vintage jewelry mixed in with organza bags and strands of beads and baggies... lots and lots of baggies. Last, but not least... I give you a glimpse of one of the walls. The walls are covered with postcards and images. Some might go crazy in a room like this. For me though, I find great inspiration in visually absorbing the "horror vaccui". On the plus side, it helps to cover up some of the retina-burning green. But I am not alone... there are others who are like me. Some probably who think they are bad, but probably aren't as bad as me. 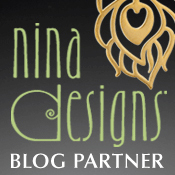 What a lucky duck I was to be selected to participate in the Nina Designs Blog Partnering! For years I've been a fan of Nina Designs. 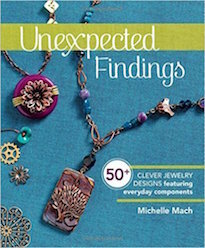 I love the clean aesthetic and polished look of the charms and findings they offer. Another thing that I like is their dedication to corporate philanthropy; the company offers micro-loans to artisan tradespeople around the world and they've done fundraisers to help build orphanages in China. So when I work with pieces from Nina Designs, I know that I am doing a good thing – I'm not only adding more beauty to the world, but I'm helping improve the lives of others. My design aesthetic can be described as being .... a little over the top... at times. But I think that when you've got a really well-crafted component, sometimes the best course of action is to let it speak for itself and to find subtle ways to spotlight and enhance the focal. 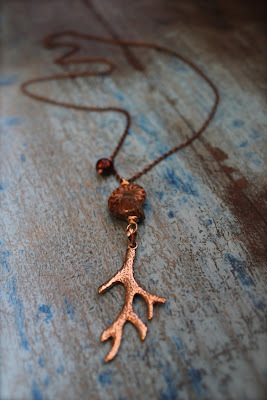 In the piece above, I used a bronze coral branch pendant. 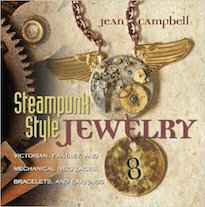 I wanted to accentuate the nautical theme by pairing it with an ammonite and a pearl dangle. I strung the dangle and the focal from a brass cable chain necklace. I think the warm tones of the fossilized aquatic creature marry the rustic patina of the chain the modern flash of the pendant. When I design bracelets, I like to think about movement and how jewelry will "sing and dance" with the gestures someone makes. In this piece I utilized the brass jump rings with Swarovski Xilion Pendants in Chrysolite Opal. I also used wire-wrapped dangles strung up with dark blue labradorite tubes to accentuate the movement in this piece. In the bracelet, I also used an African brass tube bead flanked lotus petal charms. The lotus petals are so highly polished that they dance with light when worn. I like the palette of blue and gold; it reminds me a lot of ancient Egyptian jewelry and early Renaissance frescos by Giotto. It has a rich and luxurious feel. For the rest of the items sent, I incorporated them in earrings. In the first set of earrings I played with the gold-tones of the tiny key charms and hook earring findings. I used Sunflower-colored Swarovski crystal rondelles with Sand Opal drops with them. In the second pair of earrings, I really loved the shape of the tiny feather charm. I had some Amber Opal-colored mosaic Swarvoski crystal Galactic vertical pendants and thought that they went together perfectly. I dangled these from a length of chain connected to gold-plated earwires bridged by a wire-wrapped link strung up with a Sand Opal Swarovski crystal. In the third pair of earrings, I used the 3 Circle links. I wanted to play with the negative spaces and dangled a Xilion pendant that I used in the bracelet. I also added a fringe of wire-wrapped dangles with clear Swarovski crystal bicones. I think they're very elegant and posh. I had a lot of fun working with the components from Nina Designs. I think they work beautifully with either rough organic shapes like the ammonite in the coral branch necklace or with glittering Swarovski crystals (which I picked up from Fusion Beads). I highly recommend Nina Designs! FTC Disclaimer: The featured materials above were provided as part of the Nina Designs blogging program. The author of this blog has not received any payment from the above-mentioned company. The post above represents only the personal opinion of the blog author. After my last post about the trilliums that have come up, I thought about the piece that I made inspired by the flower. I was curious if there were any other artists who were moved by this spring-time muse and decided to compile a small list. 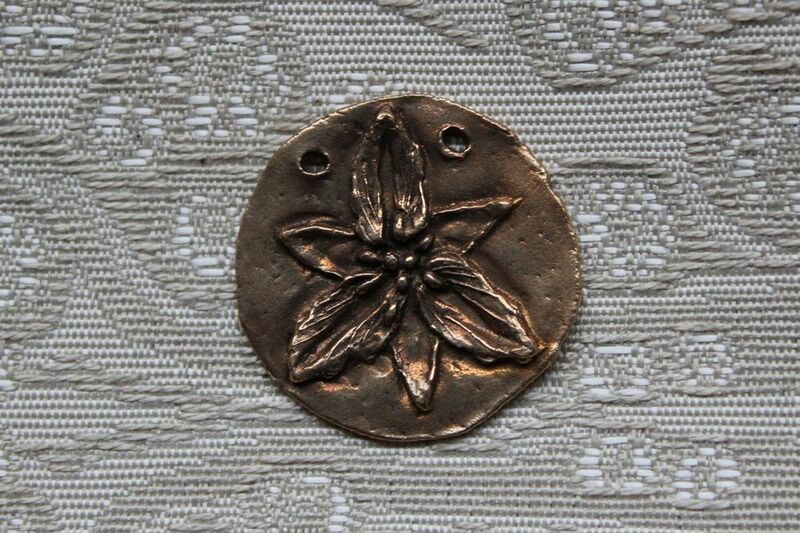 The above picture is a bronze pendant that I made featuring a trillium. From left to right: Lampwork glass trillium by Margaret Neher. Laser-cut wooden pendant by Shannon Henry. Sterling silver pendant by Samara Jewelry Designs. From left to right: Hand-painted river rock pendant by geminiriverrocks on Etsy. Ceramic pendant by DolcezzaMia on Etsy. 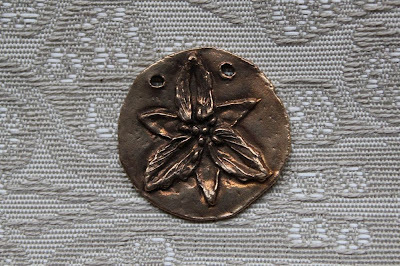 Stoneware tile with sterling bail pendant by northfirestudio on Etsy. From left to right: Carved carnelian pendant by Laughing Bird Beads. Copper-capped lampwork glass focal bead by beadaddict on Etsy. Lampwork trillium focal pendants by JessicaLandau on Etsy. Glass charm by DonkeyFarm on Etsy. 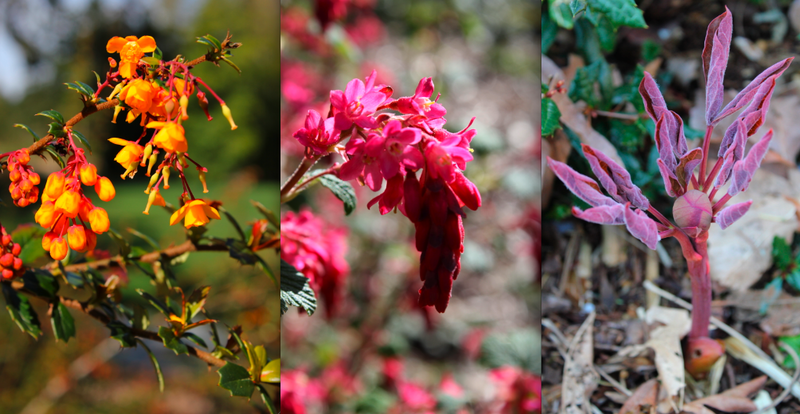 I took these pictures the day before the snow came. They are of the trillium flowers that grow in abundance around the property. They are one of my favorites. They signal the "true" beginning of spring and a welcome sight! We are fortunate to have an area so densely populated with these flowers. Ants are responsible for their propagation and it can take years for the plants to flower and decades for them to spread so thickly. 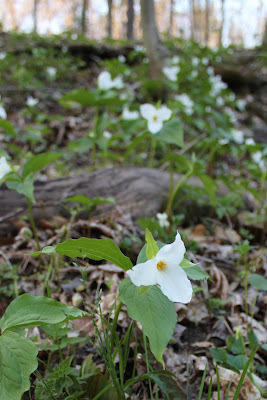 The wooded piece of property is mostly undisturbed and can be seen speckled with the bright green of the leaves and stark white of the petals in the spring. I'm still catching up from my time away. Most days are spent at the store and trying to set down more roots and establish Allegory Gallery within the community. Sometimes it seems like I blink and it's 11:30 at night and I'm still at the store. I tell myself when I'm tired that it'll all pay off. When I'm not at the gallery, I've felt an antisocial twitch. I've cooked rich comfort foods, taken long walks in the woods alone, and have taken to cuddling with the cats as much as earthly possible. They are usually very agreeable, but occasionally they make perches at the tops of the cabinets so that they can overview everything at a safe distance. When I'm weary of trying to lure the cats to snuggle, I try to work at home. My work plans have been a bit derailed with my kiln not working. I'm slowly finding alternative plans until I can afford to take the kiln in to get it looked at. I'm not mechanically minded or a tinkerer and am afraid that if I mess around with it too much, I might damage it further. Perhaps I'll make some polymer pendants? Or do something with resin? Anything really to keep the funds still coming in. Once the kiln is fixed, I've got big plans. I will continue my porcelain experiments and press out some new metal clay designs. I have some interesting ideas that I'd like to try out. It seems like I'm hunkering down until all possibilities of winter are gone and it's truly a warmer season. It's been a little over a week since we got back from our whirlwind trip to Philadelphia. William, Becki (Williams's mom), and I headed out dark and early to attend BeadFest. Although it was a short trip, I'm still processing everything that I saw and all the wonderful people that I met. It was by sheer happenstance that we ran into Gail Crosman Moore. She was in between classes and we were unfolding after the four hour drive from Western Pennsylvania to Eastern Pennsylvania. It's always delightful to see Gail. She has such a positive energy and is one of the people in the business that is a true innovator. She's always exploring and developing and creating new and beautiful things. It's really exciting to see what she's working on! I am glad we ran into each other! I feel really fortunate to be amongst such a creative and supportive community. For the most part, everyone is very kind and friendly. Barbara Lewis and the Painting with Fire crew are no exception! (In the picture from left to right: Chris, Toni, David, Barbara, and Jim.) They're so sweet and helpful. 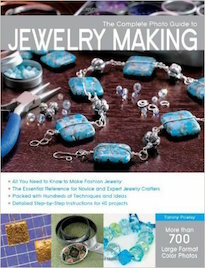 Barbara's book, Torch-Fired Enamel Jewelry: A Workshop in Painting with Fire, has become an indispensable reference book for me that I'm constantly looking at! Right as we walked out onto the show floor, we were greeted by a familiar and friendly face! 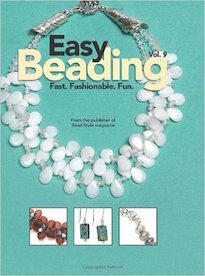 Meredith from Beadalon was demoing a flexible beading wire technique. As we made our way down the row, there were even more friends! We stopped and talked with several folks. We saw Beth from Kabela Design. Here she is, presenting their new antique silver filigree pieces. The new pieces are very nice and have an almost silky look to them. We ran into Erica Cessna and had a brief chat before she went off to take a class. She was really instrumental to the opening of Allegory Gallery and I can't thank her enough for all her help and support. While we were wandering the show, we stopped at the Bead Goes On booth and saw Sally and Amy. I really love chatting with them. Sally has so many stories and she has a very frank humor that got me laughing like a crazy person. When we pulled into the parking lot, I saw Leslie Rogalski with her sister sitting out on the curb taking a break and getting sorted out before plunging head-on into the show. Later, when we ran into them again, I joked around that they had sold their car to get more beads. (A little bit of "beader" humor.) These big shows have an almost Vegas quality to them that the idea of parting with one's vehicle to get more beads is not quite so absurd! 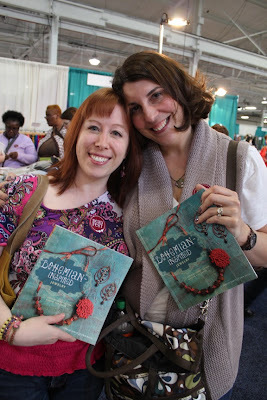 Another treat was seeing Erin Siegel and Lorelei Eurto. 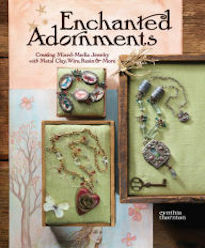 They were there with their new book, Bohemian-Inspired Jewelry: 50 Designs Using Leather, Ribbon, and Cords! It's due to come out in June, but it's available for pre-order now! 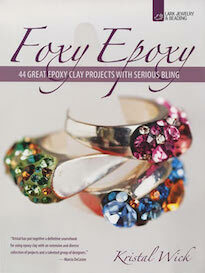 The book is simply beautiful and just full of lovely designs and rich textures. It's funny when you see someone from your neck of the woods when you're not anywhere near where you live. We saw AR of Satorious Designs and Maria Richmond of Lost Marbles (who are both based out of Pittsburgh and teach at Allegory Gallery from time to time). It was great seeing them and seeing Maria's new kits. They're both fabulous teachers and I can't wait to get them back in the store! Speaking of teachers, we visited with Anne Mitchell. We're going to try and coordinate our schedules to get her to teach at Allegory Gallery. We also hope to bring in Gail Crosman Moore. I envision planning a weekend intensive workshop around their visits. I think it could be a lot of fun and people could take a lot away from the experience! The times of year that we are talking about them coming are just beautiful and I know that people would enjoy poking around this part of the world and taking classes with these very talented artists. Of course, the planning stage is in its infancy, but I have a feeling that these will shape up to be quite the weekends! In reading back over the blog post, I came away with the sense that not everything that I wanted to say was said nor that everything I wanted to show was shared. I guess it's nearly impossible to really condense and express just how much there was to see and experience in a show like this. Even though it's smaller than the August show, there was still just so much! I didn't even scratch the surface with everyone that we saw! It really was a whirlwind event and I'm glad that we decided to go at the last minute. We at Allegory Gallery were just over the moon to host Cynthia's art exhibition, "Realms of the Forest Floor". The pieces were simply magical and everyone delighted in the fantastical root babies! She really did an amazing job and I am so proud of her. (And not just because she's my sister either, but because the show is just marvelous!) This is the first time that she's shown the root babies. They are so fun! The show is composed of nineteen original works! The whimsical small-scale pieces are inked watercolors and depict different kinds of root babies. If you're not familiar with her root babies, they are motley crew of imaginative woodland spirits that are composed of different types of plants. If you look closely at each of them, you'll be able to differentiate some of the botanical references, like fungi, flowers and algae. I like to think that they take on the characteristics of the plants that they make their homes out of. If you weren't lucky enough to make it out to the show, all is not lost! CLICK HERE to check out all the pieces. You'll get a look at the show and if you'd like, claim one for yourself! They really are darling! Cynthia's work is highly collectible and we really are fortunate to have her show with us! To accompany the lovely artwork, Jewels Phraner of the Oven Lovin' Blog whipped up some tasty treats. She created yummy pistachio cupcakes with pink champagne icing and mini caprese bites. Here's a look at the entire spread! We served up her delicious fare with a variety of wines. She also made lemon blueberry cheesecake cookies and creamy mushroom crostinis. All of it was downright good. It's a shame that there isn't a link that you can click to get a sampling of the treats offered at the opening like with the artwork. However, if you CLICK HERE, she does have some of the recipes listed. When my partner and I started dating, I joked around that my love could be bought with Anne Choi beads. I'm a smitten kitten with her beads! Each of them is a little piece of artwork. I like knowing that when you buy one of her beads, you help an artist live a creative life and support the creation of more beauty. The above two are the latest additions! Every now then, I get a little reminder that I am loved. In my collection, I have a little velvet pouch filled with such reminders. Some were to commemorate birthdays, anniversaries, or holidays... and some just because I am somebody loved. 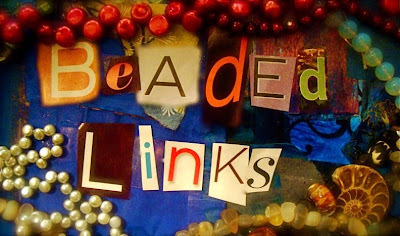 When I found out that we were going to have a little bit of time to poke around Seattle, one of the MUST SEE places on my list was Fusion Beads. I was so happy that we were able to go. Over the years I've come to love the fine folks who run not only the brick-and-mortar shop, but the online shop as well. So it was only natural that I wanted to see the store in person! These cabinets show all the different classes available. It boggles my mind! They've got dozens of class offerings featuring a wide variety of techniques, styles and mediums! I know that if I was in the area, I would definitely be a class junkie. The beads and findings presented were well curated and it wasn't just a bunch of junk beads. (Sometimes when a store is so big, there's a lot of cheap filler, but Fusion Beads overflows with wonderful beads.) 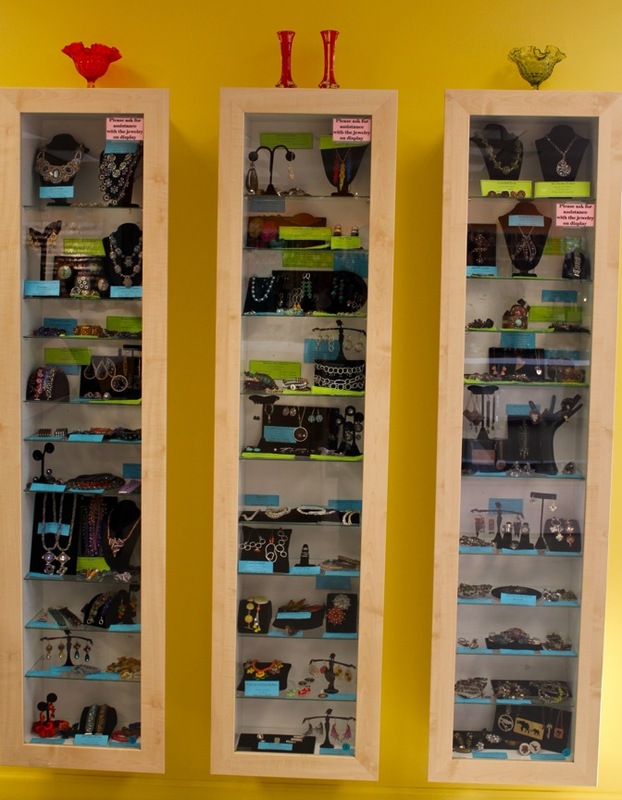 They had a HUGE array of Swarovski crystal, artisan beads, metal filigree, and a rainbow of semi-precious stones. 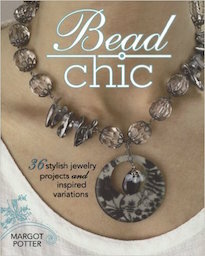 Not only is the selection of beads amazing, but the sheer size is impressive! Our little store could easily fit inside their store eight or nine times. Seeing everything laid out was really inspiring! I think though that one of the most impressive features of Fusion Beads is their great staff. We had a wonderful time talking with them. They were so helpful and didn't miss a beat when we had unusual questions or requests. In the photo: Stephanie, Claire, Chyrstie, Teukie, Allison, and Caitlin. What a great store! We had such a great time looking around and finding treasures. The store has such a warm and welcoming aura. I definitely recommend visiting it if you're in the area! 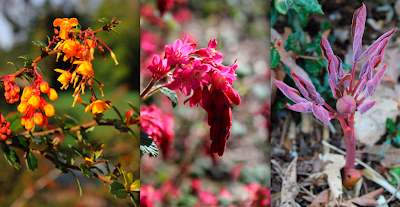 While we were in Seattle, we had a chance to walk around the arboretum. It was strangely sunny and we took full advantage of the good weather to stroll about. We even met up with one of my friends who's a transplant from New York City. One of the things that just blew me away was the sheer size of things. A normal tulip tree looks pretty, but when the blooms are easily two feet across, it makes the flowers even more magical. Almost as though you've stepped into some kind of primordial forest or something. A bouquet of blossoms rested on a fanning of dark emerald leaves with these rhododendrons; they took on a flowered crown-like appearance. Lots of luck! This little drip of a creek was flanked by a heavy mat of clover (also known as wood sorrel). In the more "swampy" area, there were these lovely yellow water flowers. 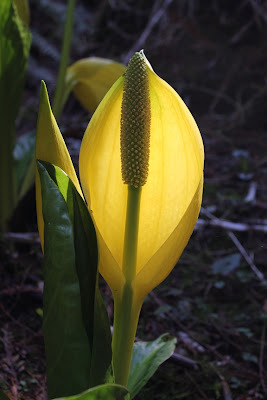 They looked to be calla lilies, but I wasn't sure. Stark and white, the blossoms of the camilla stood out! I really loved the size of the trees and how they seemed to create a magical canopy overhead. All around, life was pushing its way through or flourishing brightly. The flowers were bursting into life and it made it feel like spring. I regret to say that I didn't take more pictures while at Uwajimaya in Seattle. Once we made it through the food court, I have to admit that our senses went into cute overload and I kept saying, "Oh that's cute! Oh that's cute! That's cute too! And that's cute!" From the stationary to the packaging, the clean Asian aesthetic and just down right adorableness transformed the mundane into charming, sweet and almost irresistable. I even tried rationalizing buying a $20 roll of masking tape because it had little sakura blossoms in bubblegum pink with big-eyed kitties on it. It was hard to restrain myself from picking up everything with a portly lucky cat, chubby owl, or smiling tanuki on it. Somehow I did and managed to leave with only a few treasures. One of the things that I miss about New York is Beard Papa's. I used to work around the corner from one and would often times get a cream puff before I went into work. I really love the freshness of the cream puffs they make. Everything is filled on the spot, so they aren't soggy. The fillings also don't have that "artificial flavoring" taste and are certainly not dyed-custard yellow. The freshness makes them airy treats that went down quickly! Cynthia and I decided to split a vanilla cream puff and a green tea one. They were SO GOOD! 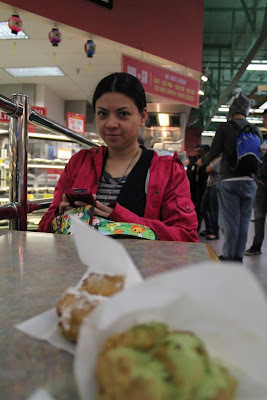 It was hard to pick any one place, so we just made our way down the food court, sampling different treats. One of our stops was the Saigon Bistro. We got two shrimp salad rolls with a sweet dipping sauce and some vanilla sodas. After we finished up in the food court, we rushed through the isles trying to take in as much as we could before we had to leave. If I didn't have to worry about how heavy my luggage would be, I'd be in bad trouble! I could have easily filled a suitcase full of Asian groceries that are not easily located here in Southwestern Pennsylvania.